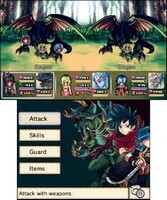 Developed by Hit-Point Co. and published by Kemco Games, Justice Chronicles is a fairly unique JRPG that will likely entertain you for many hours, but how does it fare to the classics in the genre, such as Final Fantasy, Dragon Quest, etc.? Continue reading our review to find out the answer to that important question! 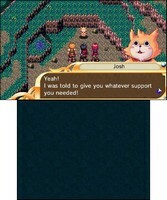 The gameplay is quite enjoyable and pretty straightforward for a JRPG at first-glance, however the beast partner system really adds a unique spin to the formula. The game also possesses a fantastic crafting system and an incredibly unique dual-layered world that'll draw you in, as well as a captivating story that'll keep you coming back for more! The game is also quite lengthy with over 40 hours of gameplay plus plenty of side-quests so don't expect to beat this game in only a few days! The controls are very intuitive and easy to learn and the optional touch-screen features are a nice touch! The game can be quite difficult, especially during the second half of the game so be prepared for a serious challenge! Visually the game looks decent enough, it won't blow you away, but it does have a nice art-direction and the world itself looks quite unique which is a definite positive. On the audio side of things, the game is good. The sound effects are pretty basic, but the soundtrack is very good. You won't find yourself humming any of tunes in the game, but we still enjoyed the music quite a bit! 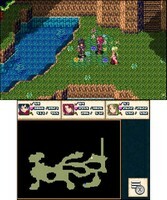 With solid to great gameplay, flawless controls that are easy to learn, as well as fantastic features such as item crafting and the partner beast system Justice Chronicles is definitely worth its price especially for JRPG fans, it also has a fairly good audio-visual presentation which helps the game's overall score! So ultimately we give Justice Chronicles a very good level of recommendation! Justice Chronicles sounds awesome! Nice review @Ichigofan. Great review! This game sounds great! Nice review! What is up with all of these roleplaying games releasing on Nintendo systems this year? @Kain It IS the year of RPG's after all.